Built-in electric fan ovens are the best ovens you can buy, in our cheffing opinion, and that is what we have collated here. Now, before you accuse us of gross discrimination against gas ovens, or standalone cookers, we should point out that all the ovens here have been selected after lengthy assimilation of both professional and user reviews and, as sad as it may seem, the trusty old gas oven just isn’t very popular anymore. Of John Lewis’s range of third-party ovens, just seven out of 285 built-in models are gas. This is hardly surprising since the best electric electric ovens are now more economical than ever, more controllable and fast (or the exact opposite, if you want to cook low and slow) and easier to clean. Electric ovens just have so many advantages and can be installed in literally any home. When it comes to buying a cooking system, there are two choices: a standalone all-in-one range cooker with a hob, oven and grill (and sometimes more). Or there's option B, which is a separate built-in oven and built-in hob. Range cookers simply slide in between your kitchen cabinets and are a good choice if you’re on a budget, have a country-style kitchen or don’t fancy calling in the services of a carpenter of kitchen fitter. Built-in systems, on the other hand, are a much more elegant solution since everything fits flush with the kitchen cabinets, leaving no unsightly gaps for crumbs, fatty bits and spilt liquids to fall between. We’ve already covered built-in gas hobs – which are excellent – and induction hobs – which are excellent, but weird – so hop over for a look, once you’ve finished digesting this carefully curated list of fine food fabricators. T3's top tip when it comes to ovens? If you can’t be arsed with scrubbing fatty muck off the oven walls every few weeks, we'd recommend a model with fat-absorbing catalytic linings or, better still, a pyrolytic model that uses extreme temperature (500ºC or higher) to carbonise the crap out of everything, reducing stains to a fine, slightly sinister dust. When it’s finished cremating, you simply vacuum out the remnants. Even the best built-in ovens are a lot more difficult to install than range cookers. Firstly, you’ll need a big enough cavity in your kitchen cabinets, and one that’s within easy reach of a suitable power supply (most ovens are too powerful to simply plug into a nearby wall socket). You’ll also need to have a platform constructed that’s strong enough to hold the weight of the oven, and with plenty of clearance to meet the manufacturer’s safety guidelines – in some instances you can purchase a ready-built casing for the particular model in mind. All of this requires expertise and a pair of strong arms so be prepared to fork out extra on a carpenter or specialised kitchen fitter. You might even need to have your electricity supply beefed up to meet the oven’s power requirements. Once in position, the oven should fit flush with the cabinets, but make sure that everything is level, works correctly and that the oven door can open fully before handing over the cash. If you’re a fan of Great British Bake Off, you’ll doubtless have spied the Neff ovens with doors that slide beneath the units… and wished you had one of those. Well you can! True, we can’t be sure this particular Neff is the exact same model as those featured on the TV series but it does come with the company’s unique Slide&Hide door, so that’s a good start – even though it does clatter a bit and, on one episode of GBBO, fell off. But that only happened once, and it was probably due to misuse, under pressure. Nearly every user of this model has extolled the virtues of its baking prowess and capacity to turn an average baker into a cake-making maestro. This is mostly down to the oven’s exceptionally accurate temperatures and its Circotherm technology that ensures whatever you sling in there is cooked perfectly evenly – and that goes for roasts, too (obviously). This same tech also allows you to cook a number of different dishes at once without any intermingling of flavours – no more chicken-flavoured apple tarts, then. And speaking of chicken, this oven is by no means only for baking – it'll roast things very nicely as well, although on this model there's no built-in temperature probe to help out more hapless, meat-charring cooks. The Neff comes with a suitably ample 71-litres of interior space, a grill section – though it doesn’t come with a grill pan – and pyrolytic self-cleaning. According to its army of disciples, it’s very quick to heat up and its 2.5-inch TFT touch screen is fairly simple to use. But it’s that clever articulated oven door that really clinches it. The Neff website lists this model at £1,049 but you can snap one up at John Lewis for £790 or Curry’s for… also £790. Fancy that. The first thing that strikes you about the Siemens HB578A0S0B is just how good it looks. This built-in multifunctional single oven is a head-turner alright, but it has a specification to back up the design. It’s perfect for families, or indeed the very hungry thanks to its generous capacity too, with no less than 60 litres on offer in the main oven. Another big bonus is the speed with which the Siemens HB578A0S0B heats up and it’s similarly impressive when it comes to providing consistent heat. In fact, it’s ideal for baking where blips in temperature can often render sponge cakes and other delicate recipes useless. The powerful heating credentials do, of course, also make it perfect for across-the-board meal making. We love the 30 different automatic cooking programs, which make mealtimes a fast and efficient exercise. Simply select the dish, tell the oven the weight of the food and it’ll get on and cook everything for you in no-nonsense fashion. The ‘cool start’ function is a boon as it lets you pop in something directly from the freezer if you forget to take it out the night before. Which we all, inevitably, end up doing. There’s more; the child lock is a nice addition, while the non-tip shelves make a lot of sense too if you’ve got hot juices sloshing around, as do the telescopic runners that aid entry and exit shenanigans. The timer works a treat and there’s pyrolytic self-cleaning, but you can switch on the interior light manually if you prefer wiping the interior down yourself. If you can’t quite stretch to an all-conquering Neff, then Bosch is still a worthwhile mid-priced Germanic option. Its gear is generally well built, efficient and mostly reliable. And it's made by BSH, the same mega-brand as Neff and Siemens, as it happens. This Which? Best Buy has received a remarkably high score while its extensive throng of users have nothing but good things to say about it. While its oven door doesn’t do any fancy disappearing acts like the Neff, it does at least open and close with Audi-like finesse. In fact, with this model you can shut the door quite aggressively and, like a modern loo seat, it will simply slow to a gentle close. The Bosch is equipped with 71-litres of interior cooking estate (give or take a few centimetres for shelf brackets etc) and self-cleaning catalytic linings that absorb the fats splattered against its wall by the pork cracking roast you will most certainly rate as one of the best you’ve ever roasted. Rather like the winning Neff, this model also cooks evenly on any one of its five shelf positions, making it another top choice for discerning bakers who demand consistently accurate results for every bun they bung in the oven. The John Lewis & Partners JLBIOS634 is a fan-assisted electric single oven that also packs a very decent grill. It’s also fast and efficient, with an A+ energy efficiency rating, which makes it a solid choice. However, the multifunction appliance really comes into its own once you start exploring its array of features. The fun starts with the white LED digital display, which features a minute minder along with a child lock for safety. Controlling the John Lewis & Partners JLBIOS634 is a doddle, with a beefy selection of functions that cover all kinds of cooking tasks. It’s great for everyday recipes, thanks to rock-solid conventional settings, but the oven is also brilliant for gentler moist fan baking duties. It’s handy for dough proving too. The John Lewis & Partners JLBIOS634 also boasts a pizza setting, which is mighty handy when you’ve got a family and distractions can result in ruined meals. Similarly, the plate warming function is convenient and we also love the turbo grilling function that lets you achieve the crunch factor without overdoing it. Another plus is the food heat sensor probe, which keeps tabs on whether dishes have been cooked through or not. Capacity-wise the John Lewis & Partners JLBIOS634 is more than adequate for most families, and the consistency of heat throughout the oven is impressive. This multifunction appliance seems able to cope with challenges like baking particularly well, although heats up and runs nicely enough even if you’re doing a standard roast dinner. It’s all good. The pyrolytic cleaning isn’t quite as impressive as we’d like, although it’s also an easy appliance to clean manually, so that’s not to dismiss the John Lewis & Partners JLBIOS634. In fact, we’d say it’s a superb choice on most fronts. Need more space for a roast beef banquet with all trimmings while baking a tricky chocolate fondant at the same time? 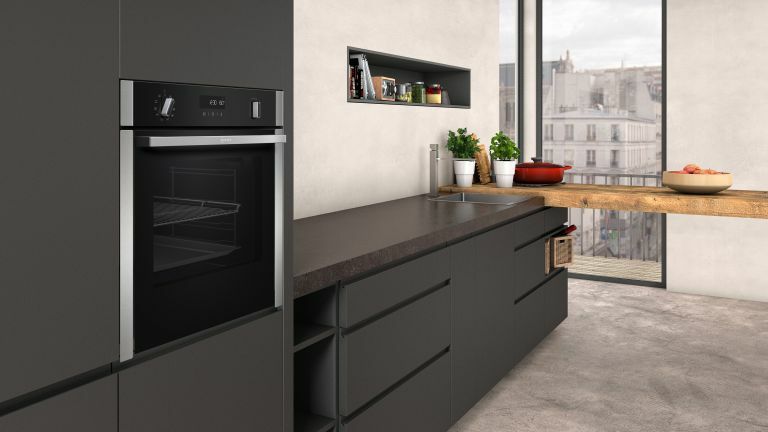 You need a twin oven, mate, like this dapper double do-it-all model from the house of AEG. The bottom oven has 61 litres of room for large stuff like chickens, turkeys and anything else you want to throw in it, while the top 43-litre cavity also doubles as a grill big enough to brown six slices of Warburtons. Both ovens come with hot air fans that spread the warmth evenly around the cavities, ensuring perfectly even crisping of your mac ’n’ cheese and uniform browning to the top of the lemon meringue pie. However, some users have reported that the temperature isn’t as accurate as they’d like and even more have lambasted the perplexing manual. What’s new? It also uses a hefty slice of electricity when both ovens are at full bore. On the plus side, the touch control panel is easy enough to navigate (unless you have fingers like pork sausages), both cavities are swathed in self-cleaning catalytic linings and the whole shebang looks pretty darn swish in all that brushed silver trim. This premier piece of Germanic engineering represents the best that Miele has to offer. And when Miele puts its renowned expertise into a high-end product, you know it’s going to be a humdinger. For just shy of four grand you might justifiably expect an oven with 24-carat gold linings, titanium roasting racks, diamond-encrusted control dials and a door handle made from antimatter, but of course you don’t get any of that. In fact you don’t even get a door handle, mostly because it doesn’t need one. Instead, you simply tap the Touch2Open icon and the door gently opens to 90º. Nice. The oven cavity itself is also about six litres bigger than average (76 litres to be precise) but it’s what goes on behind the scenes that matters most. Let’s have a look at the control panel first. This one comes with a multicoloured M Touch display providing access to a myriad of features, including a raft of fully automatic cooking configurations dedicated to specific meats, breads and cakes. You can also wave goodbye to complaints from family members about your overcooked roast grouse because it comes with a digital wireless probe that lives in a recess in the oven door. Simply pull it out, stick it in the grouse and when it’s at the precise temperature, the oven stops and presumably sounds an alarm along the lines of ‘ding, your bird is ready, sir or ma'am’. Do you like baking? You do? Well this might be the oven of your dreams. Miele’s Moisture Plus mode gently puffs steam around your dough or batter, ensuring exceptional moistness. The exceedingly accurate oven temperature – which goes up to 300ºC incidentally – guarantees that your breads and cakes will come out of the oven encased in outer crust perfection. Getting your buns out of the oven is a cinch too because all the racks are on smooth, telescopic runners. Oh, and don’t worry if you’re in rush because this model heats up amazingly quickly and self-cleans using scorching, pyrolytic technology, as on the Neff at #1. As you’ve probably gathered, this stunning kitchen centrepiece is completely devoid of ostentatious bling and filled instead with the kind of tech that turns a crap chef into masterful one. That's worth nearly £4,000 of anyone's money, surely? This elegant slab of silvery Smeg features Eclipse glass that appears black when the oven is off and transparent when on. Its LCD display is animated too, showing you from a distance that everything is tickety boo on the cooking front. A very reasonable 405 quid buys you an ample 70 litre roasting and baking capacity with integral grill, plus 10 different cooking functions, including a Sabbath mode for Orthodox Shabbos-observant Jewish families. This mode basically allows the user to turn the oven on prior to the Sabbath and keep it on until the following day. The Smeg’s vapour cleaning system is a boon for those who refuse to get down and dirty with a scrubbing brush. Just fill the oven’s recessed base with water, turn it on and it’ll steam clean the interior. All you have to do is wipe away the gunk. The same recess will also accommodate a pizza stone. This is another popular oven with few user quibbles though one or two have had issues understanding the fiddly digital rocker switches. Nevertheless, it’s keenly priced for a Smeg, is well specified, heats up quickly, cooks well and looks the dogs’ gonads. And so we come to the cheaper end of the wedge. But don’t let that put you off because this appliance of science is a stonking performer for the price. It heats up rapidly (about 9 minutes to reach 180ºC) and, according to Which?, its grill is one of the very best out there. The oven also goes up to 275˚C which is 25˚ higher than most – very handy for pizzas. For the price, this 68-litre oven’s temperature settings are pretty accurate, so you shouldn’t have any issues with half your roasties looking bland while the other half have a deliciously scrunchy brown top. And if you’re after an oven that’s easy to use, they don’t come more doddlesome than this. Simply select an oven function on the left and a temperature on the right, then set the turn-dial minute timer and retreat. Granted, this oven’s glossy enamel interior won’t be a bundle of fun to clean, but as long as you give it a wipe down every two sessions, you should avoid having to reach for the Oven Mate and a stiff brush. Like washing clothes? Enjoy drying clothes? Then you'll LOVE this list of 9 washer dryers!